I have Mac which is always on while I am at home. I have an iPhone and iPad. 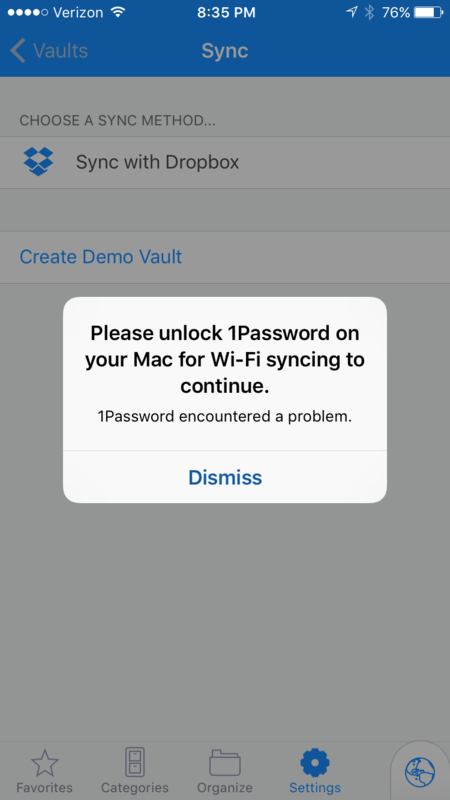 Most of the time, vault on my home Mac is locked, so every freaking time I launch 1Password on my iOS device, it greets me with messages asking me to unlock it. Yeah, right, I will get off toilet comfortable chair while ordering something from amazon to go and unlock my Mac? Nope. Please disable these messages, it annoys me when I have to press on that cancel button. If you can't connect after, let's say 1 week - annoy me, but not earlier. See annoying message in attached screenshot. Thanks for the feedback! We have an improvement report filed for this and I'll add your vote to this. I can't make any promises as to when (or even if) changes will be made here, but do know your voice is heard and some of us on the team would love to see improvements here. I am sorry it's so frustrating though. Thank you for helping beta test 1Password for iOS We hope you've found some of the fixes in last night's release useful! Add my "AAAARRGGGG!!!" to this issue as well. In 2 minutes, I've had to dismiss that darned dialog half a dozen times. @MrC I added it. Sorry for the troubles and annoyances. We'll do better.